In a first, railways converts diesel locomotive into electric, in 69 days! 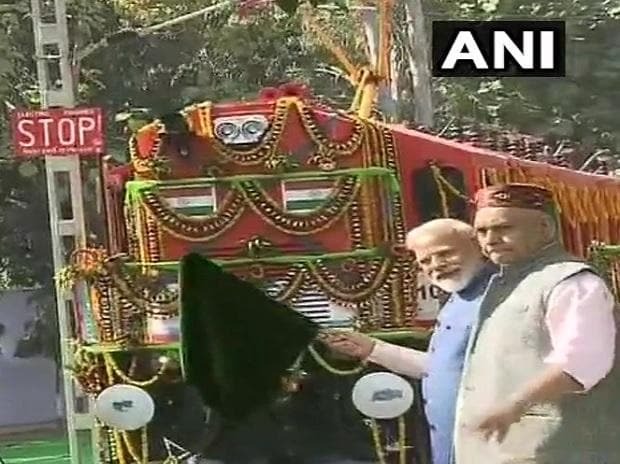 Prime Minister Narendra Modi Tuesday flagged off an electric locomotive converted from a diesel engine at the Diesel Locomotives Works (DLW) in his constituency Varanasi. In a first, the Indian Railways has converted a diesel locomotive into an electric one, as part of efforts to completely electrify the broad gauge network. Immediately after landing in Varanasi, the prime minister reached DLW and flagged off the electric locomotive. He also inspected the engine from inside. The work on the project began on December 22, 2017 and from concept to execution of the conversion of the diesel locomotive to electric was carried out in just 69 days, railway officials said. In keeping with the Indian Railways' Mission 100 per cent electrification and de-carbonization agenda, DLW has developed a new prototype electric locomotive converted from diesel locomotive. The prime minister will also visit the Sant Ravidas Temple to participate in the birth anniversary celebrations of the mystic poet of the Bhakti Movement and attend several other programmes besides laying the foundation stone of projects worth several hundred crores. He will also address a public meeting later in the day.